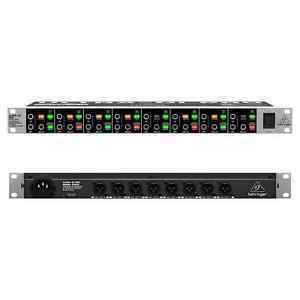 DI Box 8 Channel is a multi-purpose 8-channel direct injection box that is made for stage and studio applications. First of all, it provides impedance and signal matching for direct connection of instruments to mixers. In addition, it’s servo-balance operation gives you ruler-flat frequency response. This unit conveniently connects directly to your speaker outputs (up to 3,000 W). Because of its ground lift switch, typical ground loop problems are consequently no problem. Finally, you can link the box’s output and as a result, create easy connections to other equipment. **Notes: rental requires power and speakers. For more information about the capabilities of this DI Box, click here for manufacturers manual.